The Hittites were Indo-European people. They seem to have moved south from the Caspian Sea into southern Turkey around 2000 BC, about the same time that the Trojans were moving into Troy and the Greeks were moving into Greece. The Hittites were different from the Semitic people who had lived there before, like the Akkadians, or the Amorites, because the Hittites rode horses and knew how to make chariots and wagons for the horses as well. But pretty soon after the Hittites came to Turkey, the knowledge of horses spread all over West Asia and into Egypt as well. At some point maybe around 1500 BC, the Hittites also invented a way to smelt iron; that is, a way to take iron ore from the ground and make it into useful tools and weapons. Seeing that this was a very valuable skill, the Hittites kept it a carefully guarded secret for a long time. They made iron tools and weapons and sold them to other people of West Asia, but they would not tell other people how to make them, and so iron remained rare. We still call this period the Late Bronze Age. The Hittite kingdom collapsed around 1200 BC: nobody really knows why exactly. Some people think there was a serious drought. But whatever the reason, the collapse of the Hittites meant that they couldn’t keep the secret of iron any longer, and by about 1100 BC people all over West Asia, like the Assyrians and the Philistines, and pretty soon the Jews, knew how to make iron tools. Some Hittites, the Lycians, seem to have left Asia Minor (modern Turkey) and joined the Sea Peoples in attacking Egypt and then Israel, looking for a better place to live. Learn by doing: what is made of iron in your house? The Hittites and their Contemporaries in Asia Minor, by J.G. MacQueen (1996). The Kingdom of the Hittites, by Trevor Bryce (1999). Cite this page: Carr, K.E. 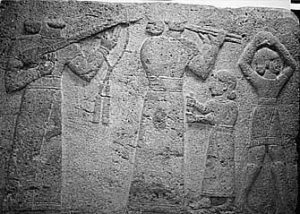 Who were the Hittites? West Asian history. Quatr.us Study Guides, September 14, 2017. Web. April 25, 2019.